How does giving birth on a beach next to a crackling fire and a waterfall sound? It’s widely acknowledged that the pain experienced during childbirth is pretty rough. Even if you haven’t experienced having a child yourself, seeing women scream in television and films while they give birth to a new baby would make anyone cringe. That’s why doctors have been trying to find ways to help manage, if not completely avoid the pain. 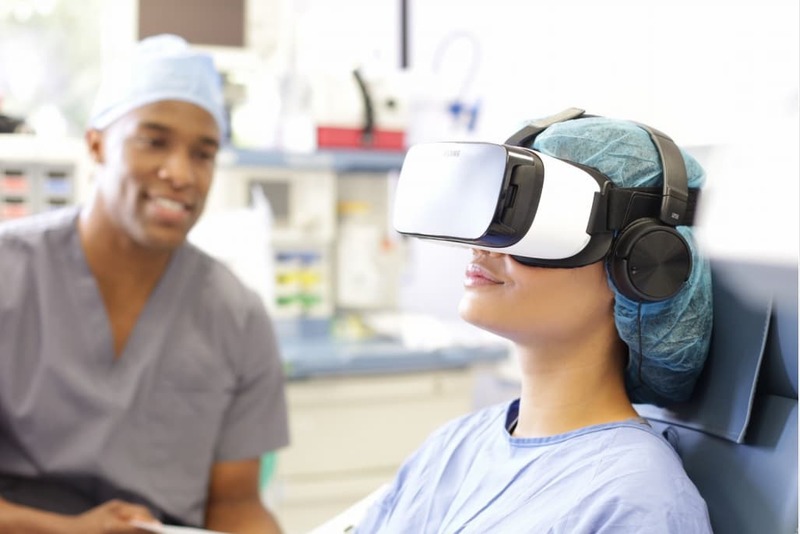 A New York hospital is experimenting with the idea of pain management using virtual reality (VR). Dr. Ralph Anderson, an OBGYN at Orange Regional Medical Center, oversaw what is believed to be the first childbirth that employed VR as a coping method for labor pains. The patient, Erin Martucci, was equipped with a Samsung Gear VR pre-programmed with a scene that induced a guided meditation experience. Instead of enduring increasingly painful labor contractions in her hospital room, she was transported to a relaxing beach vista, where she could hear soothing music, a crackling fire, a crashing waterfall, and the chirping of birds. Occasionally, a voice would coach her to focus on particular elements of the experience, as well as her breathing. It wasn’t long before she was told she was ready to push. “I was like, ‘Wait, what are you doing?’. I thought I needed the goggles to push!,” said Martucci in an interview with The Guardian. Martucci was blocking out much of her pain by concentrating on the virtual reality she was immersed in. She didn’t notice that it had almost been two hours since she first put the VR headgear. Right now, most women opt for an epidural during childbirth, a form of anesthesia that can help block out the pain from labor. It is introduced in the spinal cavity called the dura, through which pain impulses pass. The drug inhibits the passage of those signals, but still allows the body control over its motor functions for birth. As with any drug treatment, however, it comes with some side effects, like temporary hypotension (low blood pressure), slow heart rate, and backaches. Some complications could also arise from the procedure, one of which involves the dura being accidentally punctured while administering the drug.